The drama is done. So is the comedy, the wild unwrapping of gifts, the feasting and drinking, the whirlwind climax to the long and often hectic buildup, the sleep deprivation—especially when trying to write a late-night beer report for 12 straight days. It all comes spiraling down in the early morning hours of Christmas day, especially when you have three grandchildren on hand ready to roll shortly after the crack of dawn. It had seemed only minutes before that I was wrapping gifts as “A Christmas Story” was playing on its 24-hour endless loop—and then I wrote up last night’s report—and now here we were with wrapping paper flying around like confetti. We also had remote-control helicopters flying around, crashing into walls, landing in the Christmas tree, ripping a few houseplants to shreds. It was a great day, and our usual Italian-style dinner was superbly coma-inducing. Yesterday’s Baladin Nöel—an Italian Belgian-style beer—would certainly have been appropriate at the table. 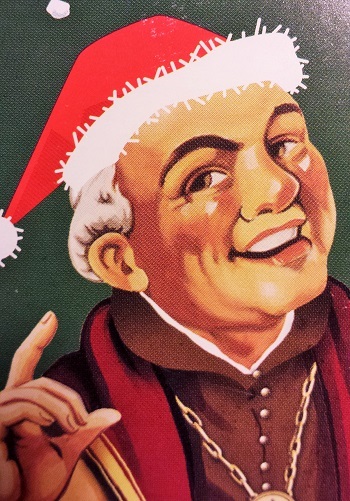 But it was tough to argue with a Belgian Belgian-style beer called a Christmas Ale, with the smiling monk-like chap on the label festooned with a Santa hat, his cheeks like roses, his nose like a cherry. 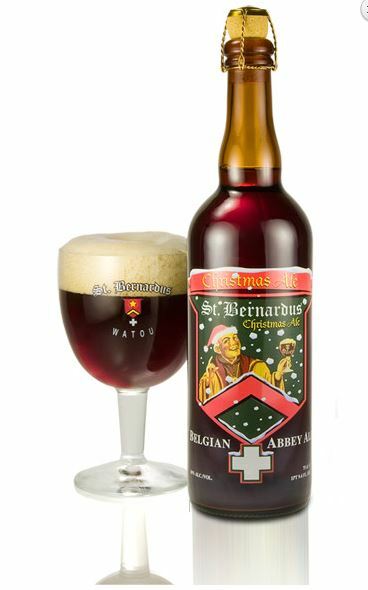 The Brouwerij St. Bernardus used to brew the Westvleteren beers for the St. Sixtus monastery for about 45 years, and when the arrangement ended in 1992 there was some mild confusion for awhile (not to mention a few lawsuits) just what the St. Bernardus beers were all about. They’re about Abbey-style beers much in the Westvleteren vein (such as Westvleteren 12), but much easier to lay hands on (cf. St. Bernardus Abt 12). A pretty good capsule review right there. I could add that the beer is the color of dark honey, tastes honey sweet and spicy (but uses no spicing), has a medley of fruit aromas and flavors swirling in the glass, and is a chewy mouthful that masks the alcoholic heat. That comes later. 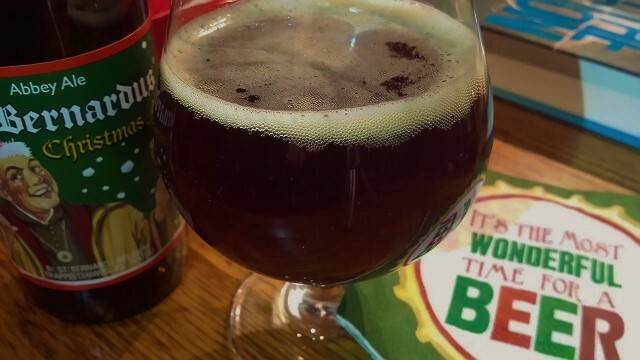 We had warmed up with a tasty 6.7% Holiday Rye from the new Hermit Thrush Brewery in Brattleboro, Vermont, then dithered about whether to have a bridge beer before firing the big gun. We decided to go right for it, and it worked great throughout the meal. It would also work well with dessert, as dessert, or as a snifter accompaniment to a cigar smoked out on the deck, even when the snow lay round about, deep and crisp and even. Okay, threw the “Good King Wenceslas” reference in for tomorrow, Boxing Day, but also the Feast of St. Stephen. But in truth, after we finally put the grandkids to bed (they didn’t really resist much), my wife and daughter and I went out on the deck for a nightcap, and I indulged in just such a fashion. There was one more 11.2 ounce bottle left, so it seemed only fitting to pop it open as the last beer of The 12 Beers of Christmas, pass the glass around, and bring it all to a right jolly old finish.